Many researchers of ex-slaves are unaware of the National Ex-Slave Mutual Relief, Bounty and Pension Association. They may have never heard of the Ex-slave Pension Club, the Ex-Slave Petitioner’s Assembly or of other ex-slave aid organizations. However, a government investigation of these associations/organizations yielded records, correspondence and more dating between 1892 and 1922. The Washington, D.C., Ex-Slave Pension Correspondence and Case Files include a collection of 8 Case files of the ex-slave pension movement which was modeled after the Civil War pension program for veterans. Here is a full description of the collection: M2110. But, the following petition provides the best explanation of the mission. THEREFORE, We the undersigned citizens of the United States of America, appeal to your Honorable Body to pass the Senate Bill, No. 1978, introduced, Feb. 6, 1896 by Senator Thurston of Nebraska, providing pension for Freedman, etc. Researching These Files Before running to the online website, the researcher must know that although the almost 300 pages digitized on Ancestry.com is a good place to start (or NARA microfilm roll: M2110), DO NOT rely on the index tool to find mention of your ancestor. Some signatures and mentions of ex-slaves in the depositions have been overlooked or misspelled. Yet, a page by page scroll of this collection may uncover your ancestor and reveal information such as slave master, state and county of birth, and age. 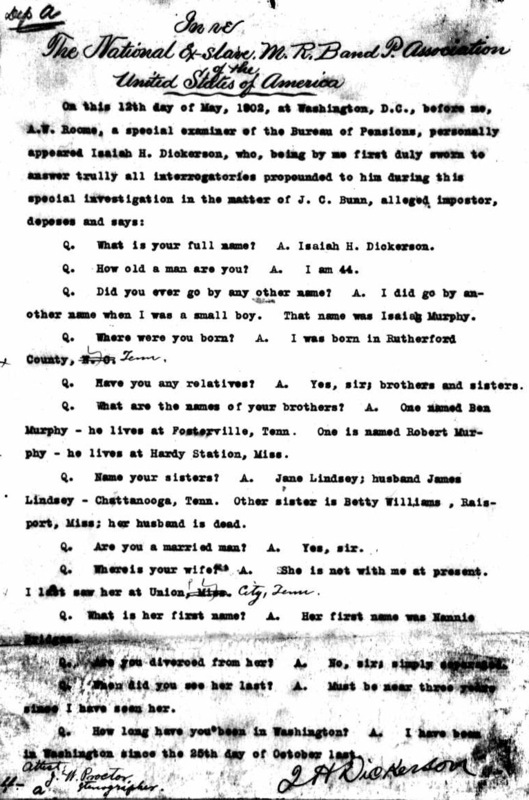 As these files were preserved as part of a federal investigation of fraud, within the Ex-Slave Pension Correspondence and Case Files depositions provide names, place of birth and residence of ex-slave ancestors. 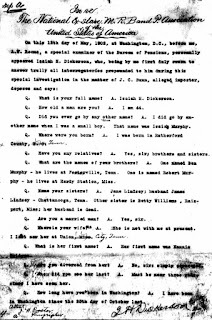 This deposition by I. H. Dickerson, a leader of the National Ex-Slave Mutual Relief, provides names of siblings, verifies his name slave name change, gives sisters’ married names and residence of family members, etc. Although each Ex-Slave Pension organization did not issue certificates, a few did. They provide a statement of : “I hereby testify that I was born a slave” followed by county (or city/county) and state. Through their fraud investigation, the US government also seized and archived many personal letters that involve the postmasters, townsmen, and leaders of the associations and recruitment flyers. Although you can research these files by name, location, etc., I, once again, encourage the researcher to review each page.